The swiss chard at the farm is bigger and more beautiful than ever before! We planted it where the chickens were last year and I think all that chicken poop really made all the difference in how healthy the chard is. 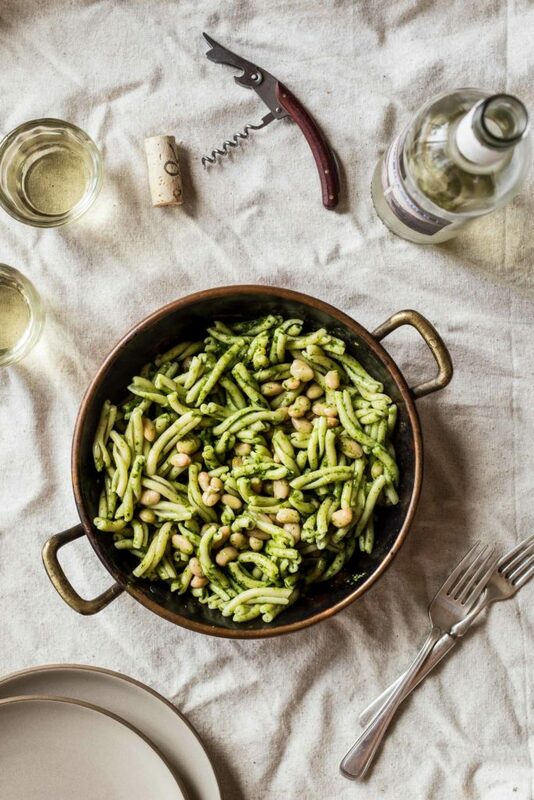 This simple summer pasta dish uses the chard leaves as the main ingredient in the pesto and makes for a unique and flavorful sauce. The pasta is bulked up with some white beans and a few toasted almonds and is a lovely vegetarian main course. Serve this dish with a simple side salad, a glass of your favorite summer wine and you’re all set! Prepare the pesto by blanching the chard leaves in boiling water for 2 minutes. Remove from boiling water and place in a bowl of ice water. Drain by squeezing the leaves in a ball in a clean kitchen cloth. Reserve the water (and add a little more if needed) for the pasta. Add the blanched chard to the bowl of a food processor along with the garlic, almonds, cheese, lemon zest, lemon juice and nutmeg. Process until the mixture starts to mix together. With the motor running add the olive oil and continue to process until completely smooth and creamy. Season with salt and pepper. Taste test and adjust as needed. Bring the chard water back up to a boil. Add the pasta and cook until al dente. Drain, reserving 1 cup of the cooking liquid. Add the pasta to a big bowl. Stir in the pesto (if the pasta seems dry add a little of the reserved cooking liquid). Add the beans, chopped almonds, parmesan cheese and season to taste with salt and pepper. Love how you bulked it up with beans and almonds. A great way to have a filling, vegetarian meal! Hi, quick question. The ingredients list says to remove & keep chard stems for an alternative use but the recipe says to use them for the pesto. Is this a misprint & we use the chard LEAVES? Or am I reading it wrong? good catch! Yep, it’s the chard leaves that make the pesto. Happy cooking!